These are manufactured with specialization for optimum performance. This hydro-extractor works to separate particles from their solutions according to their size, shape, density, viscosity of the medium and the rotor speed. The size and power of the centrifuge depends on the substance involved and can be customized according to the customer specifications. 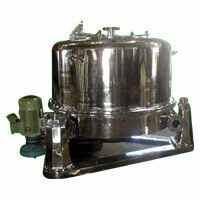 The capacity of centrifuge ranges from 300.mm to 2000.mm. in ms / msrl / msfrp / ss.